After a few tumultuous years of line up changes, Duskmachine finally returns, after eight years, with their second album, simply self-titled. Oddly, my good friends over at Massacre Records pitched Duskmachine as thrash metal in their original promo download. Duskmachine is certainly not strict thrash metal, by any means. Duskmachine: somebody forgot his sunglasses. Frankly, there's much going across the entire album with Duskmachine both blending and morphing a variety of metal genres. For instance the opening track I Feel No Pain blends thrash and power metal into a monster riff machine, then brings some wild guitar work and some nasty, but appropriate (I can't believe I wrote that), death growls just to mix things up. 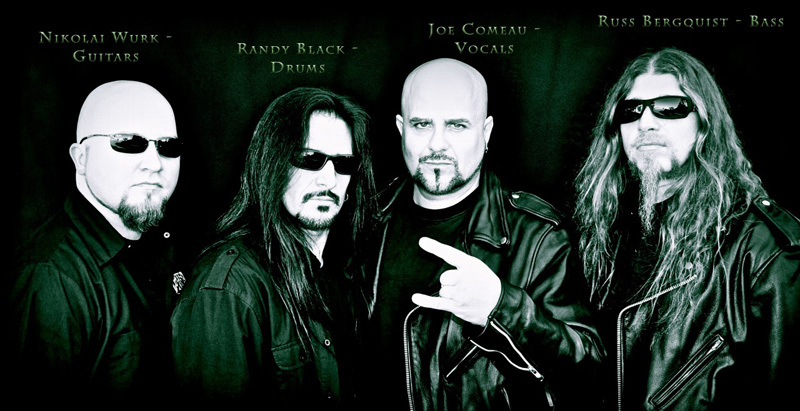 They follow this with Bloodshed, more strictly classic metal, heavy, yes, but with melodic vocals and a speedy groove. Endless turns on the same, yet with a moderate pace and more gritty vocals here and there. Later there's Conquer All which is nearly pure speed metal. Then, probably simply to throw you off again, Duskmachine taps into their emotional side with the moving ballad My Empty Room. If you have any doubt about how good a vocalist Joe Comeau (Liege Lord, ex-Overkill, ex-Annihilator) is, this will convince you of his skill; he's amazing, and it makes me wonder why he flirts with dirty vocals. The song also features Geoff Downes of Yes and Asia fame. The album rounds out with Hands of Fate and Escaping returning to that thrashy motif like the opener. With the former it's big riff heaviness and Comeau bringing his angry voice; the latter is more the melodic thrash power metal. If anything Duskmachine offers you some intrigue along the way with the variety found in the songs. But the common theme seems to be power and intensity tempered with groove and melody, much like a good combination of old and new school metal. Recommended. 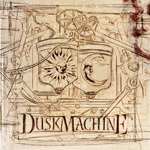 If anything Duskmachine offers you some intrigue along the way with the variety found in the songs. But the common theme seems to be power and intensity tempered with groove and melody, much like a good combination of old and new school metal.